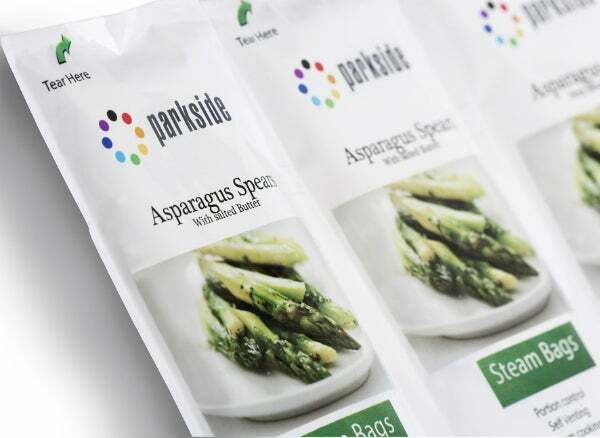 Speciality packaging manufacturer Parkside has taken bronze in the food category of the Starpack Industry Awards with its innovative self-venting steam bag for frozen vegetables, Parkscribe™ Steam. The company, which specialises in printing, lamination, laser, thermal, and sustainable solutions for the food, drink and tobacco packaging industries, was recognised for the novel pack, which taps into the consumer need for convenient cooking solutions. Parkscribe™ Steam is a hassle-free, flexible microwaveable pack, which is ideal for consumers who require a portion sized solution with a reduced preparation and cooking time compared to other methods. The food-safe pack can be manufactured with a variety of compartments and laser-scribed opening options, offering retailers and brand owners complete flexibility. The award-winning pack features a special food-safe laquer and a lasered registered seal that degrades under heat and pressure to self-vent. This allows the contents to go from freezer to microwave without special preparation by the consumer. Paula Birch, sales director at Parkside, commented: "Convenience is one of the fastest growing markets and we’re delighted that the judges recognised our innovative solution as a worthy award winner in the food category. "The pack is just one of the Parkscribe™ family of cook ready solutions that answers the consumer need for convenience. A stand out feature of this particular solution is its self-venting capabilities, created by laser-scribing technology. The consumer can now cook frozen vegetables in the microwave without having to burst, pierce or open the pack beforehand." Parkscribe™ Steam can be incorporated onto standard existing packaging lines with no impact on efficiency, making it cost-effective for brand owners. Retailers can also be confident in its food-safe credentials, the pack is fully sealed, leaving no holes for contamination. As a business, Parkside is committed to continuously designing and manufacturing innovative speciality packaging solutions. The company’s dedicated state-of-the art creative suite and laboratory facility allows customers to generate advanced new product development concepts alongside the Parkside Advanced Packaging Expert (APEX) team.